Fry up a juicy and delicious turkey in just over an hour. 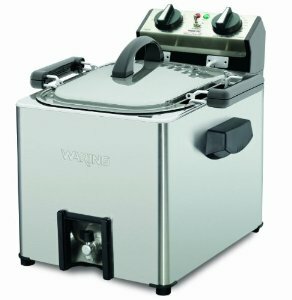 The Waring Pro TF200B Rotisserie Turkey Fryer/Steamer rotates the turkey to cook evenly, while keeping all the natural juices inside. Holds up to an 18-pound turkey; cooks at approximately 31/2 minutes per lb., 1800-watt heating element; 2.5-gallon stainless steel reservoir, Aluminum frying/rotisserie basket, holds 8 pounds of food, Rotisserie function uses less oil than traditional deep fryers; 120-minute timer, Stainless steel vented lid; Power and Ready indicator lights; Great for clambakes.